LSE Archivist Sue Donnelly takes a trip to the Shaw Library to find out more about some of the women who created or feature in LSE art works. 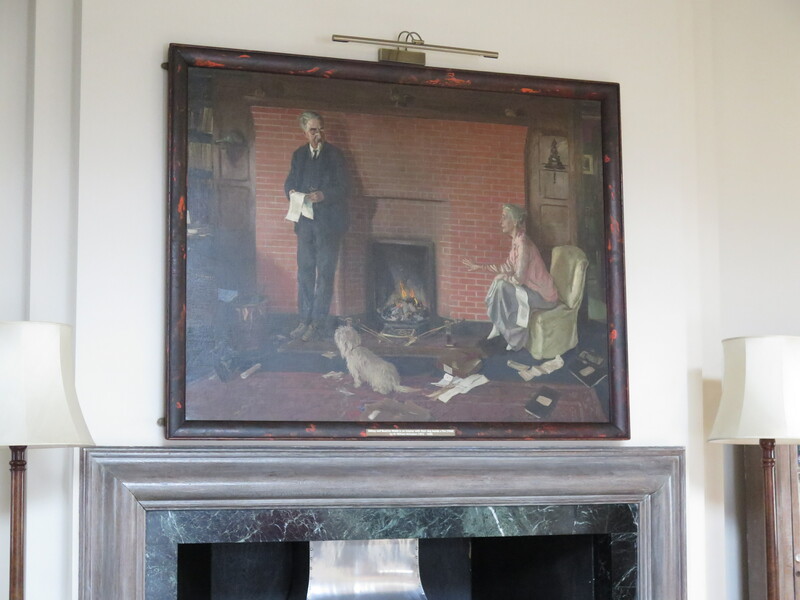 The Shaw Library (once known as the Founders’ Room) opened in 1928 and today its art works represent significant figures in the history of the School. But it remains an evocative portrait of Beatrice Webb hard at work, alongside Sidney Webb, on the proofs of their book on English local history. On the left hand wall hangs the portrait of a Judith Rees who was acting Director from May 2011 to September 2012. 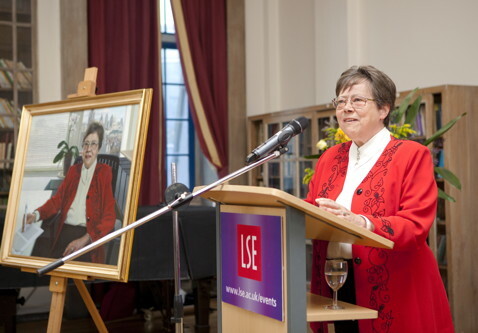 Judith Rees graduated from LSE with a BSc 1965 and after teaching at Wye College in Kent returned to LSE as a lecturer, completing her PhD in 1978. Judith Rees moved to the University of Hull in 1989 becoming Dean of Geography and Pro-Vice Chancellor. After returning to LSE she was a Pro- Director 1998-2004. She is currently Co-Director of the Grantham Research Institute. Fortunately Judith Rees will be joined by two other women Directors in the near future. Mark Roscoe was born in Australia but raised in the UK. He studied Fine Art at Duncan Jordanstone College of Art in Scotland. In 1998 his self-portrait was used to publicise the BP Portrait Award at the National Portrait Gallery. Mark Roscoe won the 2013 Royal Society of Portrait Painters Ondaatje Award and is a member of the Royal Society of Portrait Painters. Mark Roscoe also sketched Sir Peter Sutherland, formerly Chair of the Court of Governors, and the portrait is hung in the Chairman’s Dining Room. 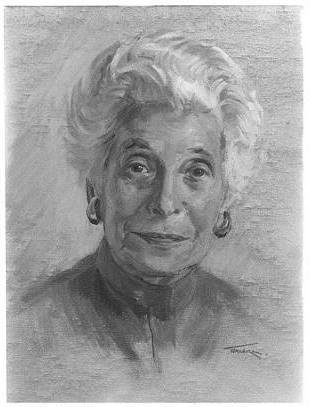 To the left of the exit to the Library Terrace hangs a portrait of former Secretary of the Graduate School, Anne Bohm. Anne Bohm arrived in Britain from Germany in 1938. She joined LSE in 1942 during its evacuation to Cambridge as administrative assistant to the Dean of the Graduate School, L G Robinson. She came to London with LSE in 1945 and as L G Robinson’s health declined she took on his duties. After Robinson’s death in 1957 Anne Bohm continued as Secretary. The School Secretary, Harry Kidd told her “we don’t really need a Dean do we: you are doing it”. When she retired in 1977 Ralph Dahrendorf said “As everybody knows Anne has been the Dean and the Registrar of the Graduate School”. Anne Bohm led the Graduate School through the post war expansion of university education and after retirement was a roving ambassador for the School. She was made an Honorary Fellow in 1988 and received an OBE in 1991. The artist June Mendoza was born in Australia and is member of the Royal Society of Portrait Painters. She has completed a wide range of commissions and for LSE painted the former Directors I G Patel (1984-1990), John Ashworth (1990-1996) and Craig Calhoun (2012-2016). On 11 November 1979 June Mendoza was the castaway on Desert Island Discs choosing Benjamin Brittain’s Spring Symphony as her favourite record and taking The Penguin Chronology of the Modern World by Neville Williams as her book. Her luxury was, of course, canvases, brushes and paint. 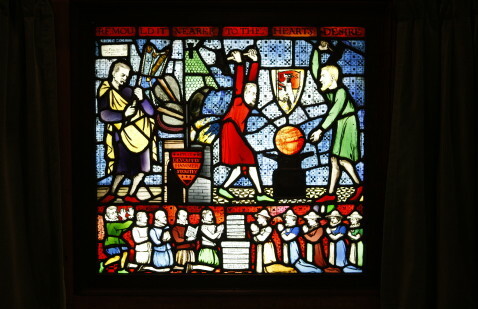 To the right of the fireplace is the Fabian Window unveiled by the Prime Minister, Tony Blair, in April 2005. The window was commissioned by George Bernard Shaw in 1910 but remained at the Caroline Townshend’s studio until her death in 1944 when it was acquired by the Webb Memorial Trust. After a series of adventures it arrived in the Shaw Library. The bottom right of the window depicts several Fabian women, though not Beatrice Webb. Maud Pember Reeves (1865-1953): founder of Fabian Women’s Group and co-author of Round about a Pound a Week (1913) a study of poverty in London. She was married to LSE Director, William Pember Reeves (1908-1919). Mabel Atkinson (1876-1958): studied at LSE and was a founder and chair of the Fabian Women’s Group and Fabian Summer School organiser. In the 1920s she moved to South Africa and worked in the progressive education. Boyd Dawson – probably Lilian Augusta Dawson (b 1874) who appears in the 1911 UK census as Assistant Manager of a Labour Exchange. She was also secretary of the Fabian Women’s Group. At the far right of the row is the stained glass artist, Caroline Townshend (1878-1944), who produced the window. Caroline Townshend was the daughter of Chambré (or “Cambrey”) Corker Townshend (architect) and Emily Gibson Townshend, a suffragette and early applicant to Girton College. She studied at the Slade and Central School of Arts and Crafts and set up her own studio at The Glass House in Fulham, West London in 1903. She designed a banner for the Fabian Society and stained glass windows for churches and cathedrals across the UK. She established the firm of Townshend and Howson with her student and apprentice Joan Howson in 1920. Caroline Townshend was a member of the Fabian Society and 1910 stood for election to the Board of Guardians in Fulham for Labour Party. Her brother-in-law, Frederick Hillersdon Keeling, died on the Somme and is commemorated on the LSE War Memorial as he was an occasional teacher at the School. Visit Art on campus for further stories from our art collections and contact Sue if you would like to find out more about using the LSE art works around campus.